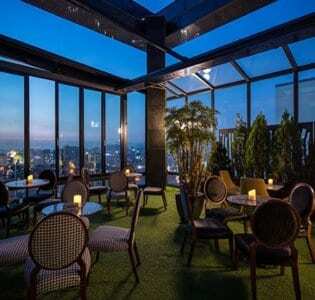 If your idea of Seoul is shaped by movies like Cloud Atlas, then this high-tech, high-style lounge bar with its dramatic glazed roof should be your first stop on any trip to the city: it’s great by daylight, stunning at twilight, and just plain epic when the disco lights illuminate the whole thing and the place goes off. From space age, brightly coloured armchairs to elaborate white chandeliers trailing ethereal tassels of beads, D.Bridge, a popular bar, nails the trifecta of a dramatic, capacious space, cool, flexible top cocktails and plenty of eye-candy among the clientele. (You’ll want to watch your wardrobe here: there’s a fairly rigorous door code and hipster tatty just won’t cut it.) Yet beyond that stunning interior, which stands out even in competitive, style-obsessed Cheongdam, the attention to detail makes D.Bridge a joy. The food offerings are lovingly presented; the cocktail menu is more of a book than a pamphlet; and the able bar crew dish up all the fine cocktailian stylings you could shake a stick at, from dehydrated fruit garnishes and fresh herbs through to – but of course! – rare whiskies. Popular with Seoul’s music industry from the get-go, quadruple threat T.O.P. (Choi Seung-hyun) is among the Korean glitterati who’ve been sighted here, while D-Bridge regularly hosts fashion events and after-parties. Best of all? Not everyone in this cool Cheongdam crowd is too cool to dance, so you stand a fighting chance of wrapping up your night by practising your very best Funky Chicken on the dance floor.